Stemming from the need to bring the bank’s public facing website up to compliance with accessibility standards, Rabobank seized the opportunity to upgrade the CMS platform, introduce responsive templates, and to structure content for content personalization. In addition to seeking a partner with the skills and experience to perform the redesign, Rabobank also sought to integrate teams such that their internal designers and developers could both contribute toward the project and continue supporting the solution once completed. SymSoft was able to quickly integrate with the extended Rabobank team to absorb existing digital marketing strategies and critical IT ecosystems. Our team frequented the Rabobank headquarters for co-working and knowledge sharing to maximize stakeholder involvement. This close collaboration ensured that the work being produced would integrate seamlessly with both worldwide brand standards and with the vision of other agency partners. SymSoft was able to work within the spirit of supplied high level design direction, adding value through the refinement of designs as they were optimized for accessibility compliance, mobile friendliness, and Sitecore integration readiness. 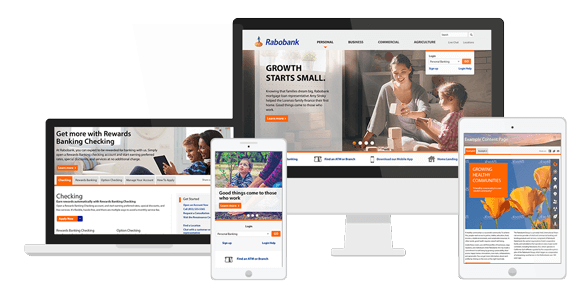 Since the launch of the new US Rabobank website, the bank’s internal teams have been successful in adopting the technical and visual design workflows without any disruption to the website’s scheduled content launches. Meanwhile, the SymSoft team has been able to re-focus efforts on content strategies to support personalization and other secondary phase feature enhancements. The trust and performance behind the relationship continue to strengthen our partnership. The new Rabobank America website is a responsive design, built to look great on all device types. SymSoft designed and coded the site to meet WCAG 2.0 Level AA accessibility compliance. SymSoft managed a co-development relationship with Sitecore trained staff at Rabobank. The shared effort leveraged SymSoft’s expertise in establishing the Sitecore infrastructure, while positioning the Rabobank internal team to be able to perform ongoing maintenance and content additions within their custom implementation. SymSoft developed a mortgage calculator tool using the visual styles of the website. This feature, complete with easy-to-use sliding scales is designed to engage users and provide a sense of domain expertise, such that users will stay within the Rabobank brand experience to begin the home loan purchase path. Similar to popular e-commerce websites, such as Amazon.com, the more people use the portal, the more relevant recommendations they get. However, people’s needs change over time and they might be interested in other incentives on their next visit to the portal. That’s why — along with the “Save to Wishlist” function — we added a single-click “Reset my Preferences” function. One click and the system starts learning from scratch.